You don't need to wear make-up and juggling is not compulsory - Honda has taken the unicycle out of the circus and reinvented it as a personal transportation device. The U3-X is a 10kg electronic unicycle with balancing technology filched from its humanoid Asimo robot. Instead of legs, though, it has a single large wheel made up of many tiny wheels - allowing it rotate, spin and move in all directions. 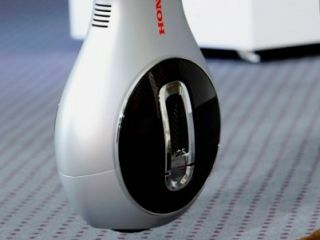 The company claims that this Honda Omni Traction (HOT) technology is world's first omni-directional driving wheel system, able to move at a similar speed (4mph) and height as pedestrians. Honda hopes the U3-X will "expand the joy and fun of mobility", and will give the U3-X its first public airing at the Tokyo Motor Show in October. Like the Segway Transporter, the U3-X works by the user simply leaning slightly in direction they want to travel. An incline sensor detects the tilt of the device based on the weight shift of the rider and determines the rider's intention in terms of the direction and speed. Based on the data, precise control is applied to return the device to an upright position, which achieves "smooth and agile movements". In addition, the device adopts a light-weight monocoque body in which the foldable seat, footrests and body cover (that also function as the frame) are stored in the body of the device. The whole unit weighs less than 10kg and can run for up to an hour on a single charge of its lithium ion battery. It measures 315×160×650mm.